SignNow makes it easy to make, manage, and enforce agreements on any device. "Finally a solution and a price point for small business." Obviously... the price. We'd looked at lots of competing products, but couldn't justify the price. Still our clients were asking for electronic document signing. We had to find something, and SignNow is great. The product is easy to use, both on our end, and for our clients. There are a few workflow issues that could use some attention, but nothing major. I would love a connector to HubSpot and QuickBooks and Highrise so that customer information could be shared. Go for it. Simple to implement. Customers appreciate it. We literally sent out our first contract within 20 minutes of signup, and we got the contract back about 30 minutes after that. Seriously, less than an hour from signup to having our first contract in hand. That's efficient. The time we wait for contracts to be returned from clients has been cut dramatically. It used to take days. Now, it's often just a few minutes. Our clients can complete a contract with a few mouse clicks. No more printing, scanning or faxing, or handling a hard copy. We appreciate your response! Thank you for the 5 stars! Customer satisfaction is of the utmost importance to us. You mentioned "There are a few workflow issues that could use some attention, but nothing major. 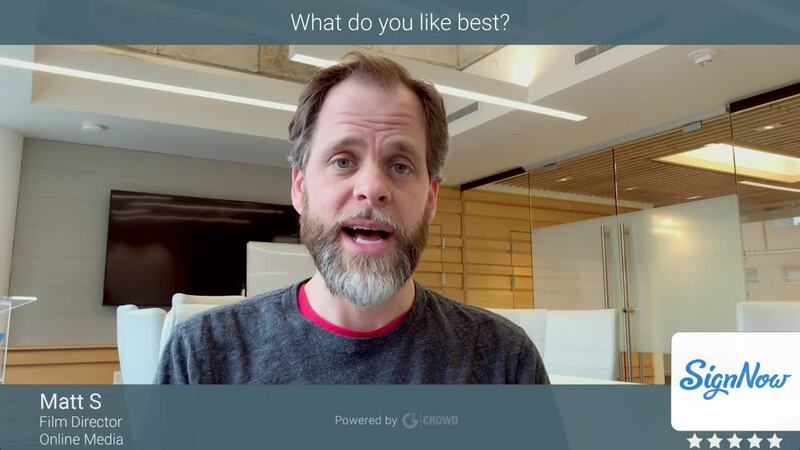 I would love a connector to HubSpot and QuickBooks and Highrise so that customer information could be shared." Again, thank you for the feedback. We are always striving for ways to make SignNow better and to be rated 5 stars by our customers. "I've found this to be a very convenient way to get release forms signed for filming purposes." 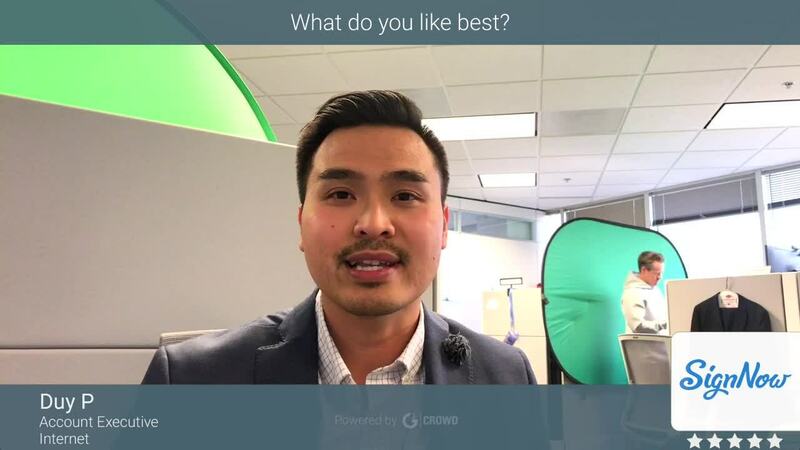 "An extremely affordable and reliable solution"
Thank you Duy for your feedback and we will keep investing in those features you describe to improve @Zoom's mobile experience and always keep investing in customer support to be sure we create the most customer-centric global organization 24 by 7 by 365 possible for you and our millions of workflow customers daily! "Loved this, actively trying to get more offices in our company to use it"
I love how we are able to reduce the time spent on onboarding paperwork in office by pre-sending the forms to be filled out at home. Also, it removes the need to scan and upload. It has greatly changed the way we hire (which is what we are constantly doing). We started using it middle of last year and the number of paper files we had at the end of the year compared to the year before was STAGGERING. I would love to be able to change the color of the fields myself. I usually only have one signer but would prefer to be able to make certain sections stand out more than the blue/light blue motif currently being used. I am consistently running into problems with people missing required fields. Also, I want to be able to add and remove templates in a document group without restarting. After uploading any individual page-- make a copy of it and manipulate the copy so you dont have to start from scratch if you mess up. We're a staffing agency and use this to send all of our client specific hire paperwork to new hires before bringing them in to onboard them. Dear Jason, many thanks for your detailed and super positive feedback! "Very user friendly and convenient. " The user interface is very intuitive and easy to use. It has been an invaluable tool to reduce paper consumption, as well as saving time, and eliminating the need to travel to collect signatures, or have clients fax or print and scan signed documents. The mobile app makes it easy to work on the go, and across all devices. I use SignNow for every transaction. The client interface is intuitive and easy for clients to use. I have encountered the occasional issue of the position of signatures moving after saving documents. Otherwise, there is very little to complain about. SignNow is an easy to use, affordable signature solution. I would recommend it to anyone looking for an e-signature solution that is simple and intuitive. It works easily across multiple devices, and syncs seamlessly with the cloud, keeping all your documents on all devices up to date, in real time. I use SignNow in every transaction. My clients find the software intuitive and easy to use. They appreciate the paperless aspect of my business, and the time saved by SignNow, not having to travel or wait for me to come to them. The problem of having to either travel to clients to collect signatures, or having clients either fax or print and scan signed documents, and the time associated with these methods. SignNow has allowed my business to reduce paper consumption by more than 90%. It has saved me time, and reduced my carbon footprint. Many thanks for your detailed positive review, Lawrence! Really appreciated! "Keeps all my contracts in a convenient location accessible 24/7!" I love how easy it is to send out contracts to my clients. I've only had one or two clients not know how to use SignNow when they receive the email from me. When I encountered that I used SignNow's helpful links to send to my client to help them understand how to use SignNow and hence sign the contract! I also love the app so that I make access the signed contracts when traveling for business. My only complaint is that when I try to add on someone's email in my account, it won't save. There is a glitch with SignNow in that capacity. Do it! So easy to use and I like better than other similar companies out there. Very convenient and effective! Process speed of getting contracts signed. I used to have people print off the contract attached in an email and then they would MAYBE sign, scan and email back but mostly would SNAIL MAIL the signed copies. Now I have people signing their contract in minutes which leads to getting deposits quicker as well. The ability to fill out digital contracts while in the field. I also like the ability to edit those contracts to suit specific needs while out in the field. Filling out contracts on an iPhone is difficult when you have sausage fingers, as the blanks you are filling in are so close together. It can be tedious at times. If you are stuck in the old paper way of doing things, this will save you time and money. Get your old schoolers onboard, go mobile, and get your contracts streamlined. I introduced the owner of the company to SignNow, and in turn it saved him a great deal of money on paper products he would have had to purchase otherwise. Carbon copy paperwork is a huge expense, as you probably already know. The convenience of streamlining the contract process has saved gas, wear and tear on vehicles, money on paperwork, and I'm sure I'm missing something. I love sign now. Many thanks for your valuable input, Mike! And kudos to you for popularizing e-signing and paperless management! It's always good to know our customers are so well aware of this potentially huge saving effect! "Very intuitive and easy to navigate." I like how I can take any document and upload to the Signnow platform. It's easy to add in customizable elements on our documents for clients to fill in. Clients love how they can log back in to review the document without having to sign immediately, I like how SIgnnow keeps me informed of the history of the document - who has viewed it, when they view it, their last login, etc. I also like how I am sent a copy of the document once all elements have been completed. That once you insert an item (say, initial block) if you click anywhere else on the document, it adds that item. Also, sometimes there's strange issues with putting items (signature block) near the margins. I would absolutely recommend using Signnow to collaborate with teams or clients The platform allows you to upload a myriad of documents to share, sign, alter, edit, ect. This site is so easy to use and intuitive. There are popup prompts to keep you moving the signing process forward. I love the reminders and notifications that come with SIgnnow! You will never have to worry if your client or team has seen or read the document - it's all right there in each document history. I love using this product and would highly recommend it to others. Online contract reviewal and signing. We also use to incorporate other vendors into the planning process for our events. Thank you for the 5 star review! We appreciate your response! We are always striving for ways to make SignNow better and to be rated 5 stars by our customers. If you have any specific questions or concerns feel free to send an email to rduncan@signnow.com or give us a call at 800-831-2050. "Very easy to use, will recommend"
The drag and drop options to complete a PDF. It makes it very simple for us to create and even easier to show people where to sign properly. The fact that people need to download an app to sign it on their phone whereas they don't need to on a laptop. Also, we have contracts that require to choose a checkbox out of 3, but we have to mark them as all clickable instead of having the option to choose one. We've researched a similar software for a while before using SignNow, it is easy to use, straighforward and price/quality ratio is very interesting. Definitely recommend. Thank you for the 5 star review! We appreciate your response! Customer satisfaction is of the utmost importance to us. You mentioned " The fact that people need to download an app to sign it on their phone whereas they don't need to on a laptop. Also, we have contracts that require to choose a checkbox out of 3, but we have to mark them as all clickable instead of having the option to choose one." We have mobile web available with our business premium plan. Please email support@signnow.com to help you get it set it. I think that will help you with this issues. Also, If you are looking for your client to choose one checkbox out of 3 the radio buttons should help you. I hope this helps. "Great Tool For Our Small Businesses"
It is easy to use, easy to send to clients. We can upload multiple templates, made adjustments to individual documents and easily review signed and pending contracts. The contracts are clean and professional looking. Nothing. Sign Now is a great service. Easy to use and worth the investment. It has completely changed the way we send contracts and documents to clients. It is a much easier option than the old "scan and email" contract. It would be great if you could file completed contracts into folders/sub-folders in order to clean up the main page a bit. When I log in I just see a wall of contracts. It would also be great if there was a search function where I could search out specific contracts or clients or dates etc. Upload all of your templates early, then you can easily modify them for specific clients. It is easy for clients to use. Contracts can be signed on computers, tablets, phones. It has made it way easier for our clients to read and review contracts and documents on whatever device they have. It has made it easier to pass information along in a timely manner. You mentioned " It would be great if you could file completed contracts into folders/sub-folders in order to clean up the main page a bit. When I log in I just see a wall of contracts." You should be able to clean up your main page with the archive folder. Email support@signnow.com to help you with this. 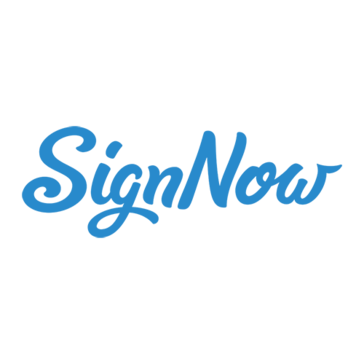 "SignNow is the best digital signature app for REALTORS I have ever used. " The use of this app is so extremely simple and easy for the advanced tech person, all they way down to the not in the least tech savvy person. I have had all walks of life find this easy to use when we were not able to sign in person. It is also easy for me to set up signatures from my phone or my laptop, in no time at all. The ease of use for both sides, is what I like best. If you are using any other signature app that is not SignNow, you are using the wrong app. I have worked with several different app and this product is by far the best. As a REALTOR, I need to have signatures done within a specific time frame. If I have clients who are not locally available, SignNow makes it easy for me to get the document to them to electronically sign and send back as quick as my clients are available. The benefits are huge in the sense that I can get my job done while I am on vacation, or not available in person, as well as when my clients are away and not available. This makes my job 10 times easier. "Signnow makes sending and receiving documents easy! " I like how easy signnow is to navigate and figure out. Whether you're sending or receiving a document, the setup is very straightforward. I also like how you can add more than one signer on a document at a time, that has actually helped us save a lot of time in that area. The only thing I would suggest is being able to edit a document after i've created it, (before sending it out). So say i copy a template and then go in and add the signers name & info, but once i exit that and go in to double check if everything is right i am unable to edit what i already put in. So say if i spelt someones name wrong i am unable to change that. If you send documents needing a signature, This is the product for you! Signnow provides us with time saving tools. What would have taken us days or weeks to get a document back, signnow makes it easier so we can get that document back in minutes. We appreciate your response! Customer satisfaction is of the utmost importance to us. Thank you for the 5 stars! We are always striving for ways to make SignNow better and to be rated 5 stars by our customers. If have any specific questions or concerns feel free to send an email to rduncan@signnow.com or give us a call at 800-831-2050. "Simple with high customization "
Having the ability to create templates for multiple service contracts is extremely helpful. The editing system can be slightly clunky and sent contracts can be marked as spam or junk by many email servers. The signing instructions do not copy over when you send an agreement. You have to go in, copy, paste into the instructions and then send. When creating forms, the actual input fields can be out of the original alignment making the finished document look sloppy. It can be frustrating to have clients download an entire app to sign. It would be great if documents could be signed in a browser so no apps need to download for a single use signing. The API using Zapier to Trainerize is not functioning and erodes significant value. I wish SignNow would correct so I could automate the enrollment and signature collection process. I have to send each and every contract manually. Also, there is no need for the duplicate emails that get sent once a client signs. Not only do you get an email telling you it was signed, you get a separate email with the document attached. So redundant. I run an online business that has international clients. The simple convenience of having digital signatures is critical. It is so affordable that it is worth some of the minor inconveniences with API and some redundancies. You mentioned " It would be great if documents could be signed in a browser so no apps need to download for a single use signing". We have a mobile web feature that directs your signer to the mobile web instead of downloading the app. It is a part of business premium. I hope this helps. In regards to the other dislikes. We are always striving for ways to make SignNow better and to be rated 5 stars by our customers. If have any other specific questions or concerns feel free to send an email to rduncan@signnow.com or give us a call at 800-831-2050. I'm a small CPA firm and require signatures on engagement letters and confidential tax documents. I've tried other solutions but some of my clients found the other solutions a bit clumsy. I've received very positive feedback once I switched to SignNow. I also really appreciate the option to choose 'do not send signed documents' for confidential information. It's a great choice for CPAs, Attorneys and anyone else needing a secure yet easy-to-use solution. It's also IRS compliant. I honestly haven't found anything I dislike. Again, I've used other solutions and this one holds its own against any of them. I guess I'd like to see a more integrated solution with PDF and DOCX documents but it works well as it. It's a great solution and worth a serious consideration. Engagement letters. IRS documents. Compilation engagement documents. Benefits: It gets the signatures I need quickly with minimal to no frustrations for my clients. "Gets the job done, but software is not great"
I like the unlimited templates. Those are a core part of our process. I also like the competitive pricing. The user experience could use some real improvements both for the form-builder and the signer. Things as simple as tabbing between fields doesn't work. We have had signers have trouble using the tool with weak connections on mobile. There is no way to rename templates. There is no way to select and move/resize multiple fields. There are not enough controls over emails and now every event generates 3 redundant emails to me. I would do trials of competitors like Hello Sign and Adobe Sign. We need our customers to sign order forms and we want that process to be a seamless and easy as possible. We also need our employees and contractors to sign contracts and docs. We are sorry for the extra email notifications, I am passing your comment to our Emails Team. Regarding fields that you add manually: you CAN actually move them anywhere you like and resize them into any shape and size you need. When you add a field to your document - there is a small resizer tool on its top left corner and also a drag-and-drop tool on the bottom left corner of the field. "SignNow has wonderful features with reasonable cost"
SignNow is an easy-to-use system with plenty nice features at very reasonable cost. It allows you to create multiple teams (each team can have a team admin). It can be easily integrated with NetSuite. Its template creation and maintenance is simply and user friendly. We implemented this system, starting from accounting department, and expanded to other departments within 3 months. Got timely support whenever we have questions. At this point, we don't see anything that we dislike. I was told that it might be not as powerful as DOcuSign, but it has everything that we need. No complaints. Test the system to see if you like it or not. I am not saying it is good for everyone but it should meet the requirements of most companies. We use it to collect vendors' banking info, tax info, customers' credit application. We also use it for internal communication from HR to Legal to QC. The benefits: paperless, much smooth process, and cost effective. Needs to have an equivalent to DocuSign's "Certificate of Authenticity". I have had several banks refuse to accept SignNow because the banks wrote into their procedures that they had to have the "Certificate", SignNow's history doesn't cut it as it doesn't associate the signature with the rest of the signer's information. Dash board needs a way to select multiple documents at once (perhaps check boxes out the left) and then take action at once on all the ones selected (like archive or delete). Great platform for esignatures. Easy to use. Careful if your users of the documents require a "Certificate of Authenticity". Completely got rid of faxing, scanning, and chasing down signers and documents. Many thanks for your positive feedback, Ron! We are glad to be of help, with going paperless especially. We cannot guarantee, of course, as this is strictly third-party decision but actually, electronic signatures created via SignNow must be treated as legally binding. Much easier to have electronic copies of sales contracts - no more paper. My products are often shipped so many times do not see clients face to face. This enables me to still have a valid signed contract. No dislikes so far! Have not even needed any tech support! Strongly recommend for ease of use, ability so send reminders, at a glance can see what is outstanding. Can definitely recommend for small business although would likely work well for large businesses as well. Previously had sales contracts signed manually at the time of sale. Now i am able to send out contracts in advance of the sale, if there are errors they can be corrected, organization is a breeze with legal electronic copies rather having to scan in paper copies. Many thanks for your positive feedback! We are happy to be part of your paperless office! "Inexpensive and robust small business tool for signing documents electronically"
I love the kiosk mode which includes the ability to create and use templated forms. Cloud sync so that we can download the contracts onto a desktop. File management is cumbersome. There are no integrations with things like Google Docs or Dropbox. The "team" concept is very limited (for example, as an admin, I'd like to be able to see documents that colleagues have sent out but haven't been completed). There are no stats about the recipient opening or reviewing the document, only info on a completed signature. Give it a try, for the price and features offered, it provides a solution that might be what you need without having to pay more. Capturing signatures in the field, without the need for an internet connection. Capturing signatures for client contracts via email. You mentioned "There are no integrations with things like Google Docs or Dropbox.The "team" concept is very limited (for example, as an admin, I'd like to be able to see documents that colleagues have sent out but haven't been completed). There are no stats about the recipient opening or reviewing the document, only info on a completed signature." We do have integration with G Suite and Dropbox please reach out to our support to help you get this set up. Also, You should be able to see documents that are sent out from your users as the admin and support can help you with this also. Please email support@signnow.com. My favorite part about SignNow is just how easy it is to upload, setup fields and be done with it. It literally takes me less than 3 minutes to upload the document, add text/signature/date fields and send it for signature. I also like that the signing process for other users is very intuitive so I don't have to explain anything, they can just follow SignNow's instructions. The only thing I wish I could do on SignNow is to be able to edit the title of the document after I upload it. I usually just upload a contract template and then add text fields to cover the blanks but then I can't change the title once it has been uploaded. Having an agreement in place and making sure that I have a legally signed document I can always review. You mentioned "You wish you could be able to edit the title of the document after I upload it". You can change the title when you make a copy of a template. I hope that helps. "Lower Price Than Competition, but Unreliable"
We looked at several products before choosing SignNow and did so mostly based on price. They had the features we were looking for and were much cheaper than DocuSign, Adobe, and other e-signature applications we looked at. The workflow/routing functionality is really beneficial, especially if you don't have another solution at your organization that can manage workflows. SignNow is not nearly as polished as other products. We've been using it for a little over a year and thought some of the bugs might get worked out, but it performs identically today as it did a year ago. Most of the things are fairly minor, but they add up quick. For example, the tab stops are erratic and cause some headache for those filling out forms. Also the documentation is poor, in my opinion. The biggest cause for concern though is the reliability and support of the product. The authentication portal is unavailable several times a week and this has been going on for weeks. When this happens, existing forms can still be filled out, but no new forms can be created or modified and form owners can not check on the status of forms. SignNow has phone and email support, but I've called the support line several times and am always instructed to leave a message and it is never returned. Also, emailing their support typically does not yield a response. I've emailed in about 20 times over the past year for different things and have received a response for five of them. Unfortunately this product is too unreliable to use. We would not purchase again, even though the price is attractive. We were trying to find a solution to handle electronic signatures, but really found the platform most beneficial for workflow management. "only option for us, but very buggy"
We needed a software that would allow for self-population. The purpose of Sign Now in our company is to create an online application for our staffing company. Because each page has the same information on it (Name, social, signature, date, etc) we didnt' want our employees to have to fill out the same info every single time. Sign Now accommodates that. When I label the field as "name" and then later make another field and label that one as "name," all my employee has to do is click the box and it automatically carries what was in the first "name" field over to the second. It makes it easy to fill out our 15page application in less than 20 minutes, especially as most of our employees can't touch type. It took me 3 months of reviewing software to find Sign Now, and it was the only thing that allowed for both the self population, and for me to upload my 15-page PDF, and have it sent directly to my email afterwards. It is very glitchy. For instance, like I said above, our app is 15 pages (plus 2 intro pages, and 10 pages at the end for a company policies). Any time I put a new box on the page and the change the size or move it to the right spot, it jumps me back up to the top of the first page, and I have to scroll all the way back down to where I was. Every. Single. Time. No exceptions. This gets really old really fast when there are 50 fields on a page that are all different sizes. The other thing that irritates me is the customer support. I called them once while we were having issues logging in, and just finding the phone number was hard. When I did call, I had to leave a message, and to this day I haven't gotten a phone call back. I also sent an email. about a month later I received a reply. Luckily we figured out our issue. Lastly, it doesn't work well on mobile (at least for us) and the formatting of the form comes back super wonky. This is a problem as most of our potential employees have phones, but not laptops. Best used for shorter documents, or documents with limited fields. Allowing our employees to fill out the application quickly and easily has actually helped us hire more people. Because of the demographic we work with, there were many times when perfectly good employees chose not to fill out the application because they were unable to read, write, or didn't have the patience for it. We have hired more employees since doing the application, and, since we're a staffing company, we've made more. SignNow is very easy to use. Not only do I use it to sign all my documents, I even use it as a PDF editor as well. I don't like how it auto-populates blocks that it thinks need to be signed or edited. It's annoying to have to "X" them all out. This product is so easy to use and offers so many great features. It's been a staple within my business toolbox for a long time and will be for a long time into the future. I am on the road a lot so it is very helpful to be able to sign my documents when not at a computer. The mobile app is very easy to use and very intuitive. You mentioned "I don't like how it auto-populates blocks that it thinks need to be signed or edited. It's annoying to have to "X" them all out." You can fix this issue by uploading the document in word format. The auto populated blocks appear if it is a PDF fillable document. I hope that helps. If have any other specific questions or concerns feel free to send an email to rduncan@signnow.com or give us a call at 800-831-2050. "reliable software and is visually appealing and orgainzed to accomplish the tasks"
We are an insurance agency which handles large amounts of e-signatures, it's good to have a clear record of which documents are pending signatures. It's great to have a tool to easily remind clients to e-sign. it seems like there is one too many steps to send out an e-sign. It would be nice to streamline a bit more, but it would save me 10 seconds, so not a big issues. If you need to collect signatures and need to make sure they are securely collected, then SignNow is the product for you. getting e-signatures is a breeze. I can send the e-signatures, move on to another task, and not worry that I have an outstanding item. SignNow makes it obvious that there are signatures missing. "Great alternative to the other bigger companies"
I really enjoy the ability to easily share and sign contracts. I appreciative that these count as legally-binding contracts. Additionally, I really appreciate how transparent the entire process is (with countersigned contracts emailed to everyone). I wish it was easier to edit the actual contracts. Since the system is set for pdfs you have to edit in word and then upload later. Insignificant if you use the same PSA/MSA for all clients, but can be slightly problematic if you run in to specific or unique issues. Make sure that you carefully review the different tiers and make sure that you understand the limitations of each one. We have used the program to solve a lot of issues in streamlining our business contracting process. Greatly appreciated from the standpoint of a small business as we do not have the staff or time to dedicate an entire role to this function. Additionally, it helps ensure that all of our signed contracts hold legal weight, which is a valuable attribute. "Good value and easy to use"
Compared to other electronic signature platforms, SignNow is very easy to use and is at a price point that a variety of different type of organizations can take advantage of it. You need to warn people ahead of time that a link is being sent to them or they may think it is spam and won't click the link that takes them to the document that needs to be signed. Like other e-signing services, there are different pricing levels but the basic $5/month option if great for basic signing needs at a price that can't be beat. Also, no specialization needs to take place - just upload a PDF and insert where people need to add info (sign, date, initial, etc. ), which is great for contracts. We need to have a lot of paperwork signed from a variety of people, and sending them by postal mail takes a long time not only just because of the postal mail process (send it to them and have them send the fully executed document back) but also because it is easy to be put in a pile on someone's desk and forgotten about. With SignNow, people can quickly sign the document and you can easily send reminders if they have not yet signed the document. Customers like it! It's easy to use and resend links if needed. Staff likes it too. People are impressed that we have a tool like this to provide convenience for them. Can be used for multiple signers. More affordable than some of the other options available on the market. Customer service is sometimes lacking. Our business is in EST zone and Sign Now is Pacific time. They don't always reply in a timely manner. (I've been trying to reach them since yesterday morning -- left a couple of messages with no responses yet). I don't have to reach out often, but when I do, it's not as easy as I would normally prefer. Set up support was helpful. I like the training resources available for admin and new users. Clients in other cities/states do not have difficulty wrapping up paperwork quickly. They don't have to come in and we can avoid the timely and costly issue of mailing paper applications elsewhere and hoping they come back. Also helps save on the cost of paper and postage. People are so busy these days, it helps wrap things up quickly at their convenience. Dear Kelly, many thanks for your useful feedback! We are glad to be of help for both staff and clients of your company! "SignNow makes all the difference in the world if you use Nintex Drawloop/Salesforce"
I'll admit, SignNow isn't perfect yet, but they have Docusign beat hands down when it comes to the control of the tag placement, the things you can do with the tags, how the tags work, the pricing per user (3x cheaper than Docusign and we get bulk upload!) and BEST OF ALL - we don't have to run our loan doc packages twice anymore, which we had to do under Docusign. Now we send the document through Drawloop, with delivery option of "email", AND at the same time, we can right click and save the package, and when we manually upload it to SignNow, it recognizes all of the tags! With Docusign we had to run the package twice: first to email it and second to send it through to Docusign because Docusign does not see the tags if it is first saved then uploaded. You have to use a template or manually place the signatures and we have 80 tags per set of loan docs! Another thing that SignNow can do is utilize tags that are already in the document, so you don't actually have to convert all of your Docusign tags to SignNow tags. Took us a while to figure that one out, but pretty nifty so we didn't have to recode all of our documents. Although now we use Drawloop Components to place the tags depending on the Delivery Option Name, so not necessary. Another AMAZING thing: bulk upload through a .csv file so we can send out a set of loan docs to hundreds of investors in under 10 seconds. Try doing that with Docusign without paying extra. There is one thing I really love about SaaS and that is the more features they have and the more advanced things they can do, the more I can take advantage of them and make our system even better. And I haven't even finished figuring out all of the advanced features of Sign Now! SignNow works better than Docusign for us in all ways, except one, and that is that when our customers are signing their documents on their desktops, they must click on their signature and initals twice instead of once For a document with over 80 signature/initial tags, that is 160 clicks whereas Docusign would require only 80. But they are going to fix that, so once they do, I will update my review. And if you do it on your mobile device, you do not have to click twice. But most of our customers use their desktop computers to sign. Get Christian on the phone to take you through it. Pretty simple once they walk you through it. In the lending world, borrowers have to sign a lot of documents, investors have to sign, we have to sign, so in addition to the normal business documents we have 100's of loan specific documents and disclosures. The hardest thing to get to work right with the Nintex Drawloop DocGen/Salesforce/esignature platform was getting the tags onto the documents in the right place 100% of the time, without have to manually modify them once the package was generated. Don't have to worry about that anymore with SignNow. Hi Corinne,Thank you for the 5 star review! Customer satisfaction is of the utmost importance to us. If have any specific questions or concerns feel free to send an email to rduncan@signnow.com or give us a call at 800-831-2050. "Great Quality at a Great Price"
I like the price - $5 per month. I receive relatively the services with SignNow as I did with a higher priced competitive product. I love the reminders of the requested tasks. I like that the completed tasks send a copy of it in an email sent directly to me. The application could be more user friendly. Application should be easier to use without having to think much. Some tasks need you to try and try again until you figure out how it works. Some parts seems like duplicates of itself and unnecessary. I am able to send documents to clients for signature with ease. We appreciate your response! Thank you for the 5 star review! If have any specific questions or concerns feel free to send an email to rduncan@signnow.com or give us a call at 800-831-2050. We evaluated a number of eSignature platforms and all had their strengths and weaknesses, but found SignNow to be the best value for the price. Once integrated into Salesforce, it's a fairly straightforward, seamless user experience to generate quotes using SignNow's technology. SignNow's SaaS platform also makes it easy to set up templates once, and quickly reuse over and over again. The Salesforce integration is a bit tricky, and in our case, required a Salesforce developer to help properly integrate. Though once setup, it's worked perfectly without any additional maintenance. For years we had customers signing documents that required them to print, sign, scan and return. We realized this was a cumbersome process for our customers and wanted a more efficient way that was both customer-friendly and helped shorten our sales cycles. We often found that approvers were away on travel and out of the office away from a printer/scanner, which delayed approvals/signatures. With SignNow customers can easily review, complete the required fields electronically, and submit back to us anywhere, anytime, and on any device. There have been a number of instances where SignNow has helped secured month-end transactions, when it wouldn't have been possible without it. It's easy to teach to any faculty/staff. After introducing them to the web application, they can easily put the forms they need into SignNow and add fields. Some features feel missing. I find that the more I use it the more I discover things that I wish I could do, but can't. I've only found one bug, which support was able to respond to and provide a work around for. It's a great way to digitize paper forms and easily send them out to get signatures. After using it for a while, I started to discover lacking features that would be nice, such as more control over the email notification frequency and the ability to do more complex conditional routing. Our university needed a platform to collect digital signatures from online students and students at regional learning centers. SignNow is saving a ton of time by expediting that process. We're also eliminating paper waste, and streamlining the internal processes needed to complete certain forms in the process of digitizing them. My favorite part of this software is how easy it is to use. I can input where I need signatures, initials, dates or text on all of the documentation so easily, and I have not had one client ask how to use it or sign it, and my clients age from 23-65. It is so user friendly and makes my business run more efficiently than ever. Sometimes my keys don;t register. When I am typing some letters are missed- but on a positive note, it forces me to always re-read what I have written or asked for. You can't go wrong with this product. It is easy to use, efficient and allows for storage and unlimited documents. When clients are "too busy" to meet in person, or late night needing last minute signatures on contracts this tool has help so much. I honestly believe it has helped me grow my business, plus I am not wasting paper or time by sending documents by snail mail. "Easy digital signing in 1 2 3"
Easily prepare documents for signing, easy to understand workflow for sending docs to multiple signers, at once, or in turns. Integration with Google Drive to automatically download signed documents to your personal drive. For repetitive tasks you can create templates to save time on future signing rounds. At the moment one can only upload PDF, no native support of .docx, .gdoc or other formats. No sync with Google Team Drives, only My Drive. Straightforward, easy to use, fairly priced tool for any type of digital business. Perfect solution to avoid sending around paper documents for signing, that end up being printed, signed, scanned and over and over again. Many thanks for this contribution, Peter! We are glad to know you find SignNow both easy and fairly priced. SignNow actually supports much more formats than you think! You can surely upload doc and docs, and also documents scanned as images (in jpg, gif, png and other formats) and also Excel files and even PowerPoint slides! However, yes, you are right, once you are done adding fields, filling them in and e-signing, you can save your documents only as PDFs. But this is done mostly for security reasons. "Easy to Use e-Signature App for Small Business"
I researched a few e-Signature software apps and settled on SignNow a couple years ago. As CFO and head of business development, I use SignNow frequently for partnership agreements and shareholder docs. I like the uncluttered user interface, which makes using this product straightforward and fast. It also saves time to upload commonly used agreements as templates into SignNow. Adding additional users in our organization is easy and cost effective. Every so often when I'm filling in a text field within a document, the app fails to capture a couple of my keystrokes. Saves time, saves paper and makes it easy to retain important documents in one place. "Easiest e-signing service I've tried"
The most significant benefit is that it's easy for my clients. They're able to fill out and sign contracts I send them with ease. Using templates is very positive for me too - I send out the same contract many times, and being able to do that efficiently is very beneficial. Occasionally the text filling on contracts is a little buggy and will miss keystrokes. Very rare though and easily fixable. Seems to be one of the simplest and cheapest e-signature services. Makes it very easy to sign contracts with clients. Improves my standing in clients' minds as the contract signing process is very easy for them. Nothing. This is a decent product with terrible support. I liked when this product worked and I could use it, but it hasn't been working properly recently. I have been trying to contact support for 24-hours because none of my documents are sending for signatures. Every time I try to contact their support I get stuck in an endless loop through their backend system. SignNow has extremely extremely poor support. I am currently solving no problems with SignNow. It has been down for more than 24-hours and I cannot get in contact with their customer support. I am having massive issues with none of my clients receiving documents to sign to proceed with projects. When this service works it is good, when it doesn't there is no way to get in touch with support to work through the issue. Thank you for giving feedback on SignNow’s service. We are terribly sorry that you experienced this issue and we are doing all is possible for absence problems you have faced. In case if you will have these or other issues, you are always free to send your complaint directly to our support manager mzvaryka@signnow.com. Looking forward to a chance to correct your impression of our service! The platform is extremely user friendly. I’ve been easily able to navigate the app with no issues. The only issue I have is once in a while the app will be functioning extremely slow. I notice when this happens, it deletes my signatures and returns the form to blank without saving. I am able to have timesheets and verification of services signed. It makes my job much more convenient. I am a 1099 contractor so I have multitudes if forms signed everyday. Many thanks for your positive feedback, Tiffany! "Excellent, but needs some Flexibility"
The ability to easily send, sign, and generate important pdfs and contracts that are needed ASAP for payroll and other engagements. I dislike having saved templates with signature boxes and needing to put them in again and again when I merge them into other documents; especially when it's a number of tax documents that never change, but I have to when I just add one page. Some flexibility and ease of use that cuts down on that repetition would be awesome. Make sure you evaluate the uses of your departments, and how the program can be used effectively across multiple parts of your company. The more you know across the company the more you can manage and roll our the program across multiple departments, and become reliant on it's notification and services to expedite and make use of the program common language. By making it common place in every department, it eliminates outdated or confusing ways of executing contracts and provides a secure and elegant signing method that all departments can streamline and access at any given time...it keeps all departments honest and understanding on where in the timeline of execution a project is. It is incredibly convenient for allowing new hires and 1099 contract workers to get added to payroll in wonderful advance of their arrival. It's also convenient for expediting and keeping track of the signing process for our administrators and streamlining access to those documents to our payroll and management folks. It adds a huge level of transparency to our company's onboarding and offboarding and hiring processes that results in excellent efficiency and self-reliance. We are always striving for ways to make SignNow better and to be rated 5 stars by our customers. If have any specific questions or concerns feel free to send an email to rduncan@signnow.com or give us a call at 800-831-2050. Convenient interface, easy to modify and cheap. Everything works as expected, and we have had zero issues using the program. We upload our documents, edit them in their program, then create a link and have our customers sign it. And if there are any issues, or something needs additional editing we just go back into the program and quickly fix the issue. From start to finish, we can upload and edit a doc, while emailing a sign here link in under 10 minutes. We would not be able to operate without this program. Nothing really, everything has gone as expected. I think we had a few issues uploading docs, but wasn't anything to really worry about, and we fixed it rather quick. Buy with confidence, you won't be disappointed. We paid for the annual cost of this program in the first day we used it. Makes getting fee sheets, and on boarding documents signed much more simple. If you are in financial services, or anything where you work with companies out of state then this program is a necessity for your business. I can actually show a boost in profit from the day we signed on with this company, it is a crucial part of our business. Streamlines all on-boarding for us. Also makes getting our fee sheets signed much easier. The price we pay for this annually was paid on the first day we used the program. "Great tool at a great price"
I love that I can have unlimited templates. My projects with clients are not one-size-fits-all, and it makes it so easy to be able to just select a different template versus how I was doing it before with another signature tool. The interface isn't very modern or pretty, and sometimes things are hard to find. That's my only complaint. Definitely give it a try! I've moved 3 clients here so far, and they all love it! I was using the free plan of another tool before I found SignNow. I was limited to 3 contracts/month and could not use templates at all. I was using their Google Drive integration. So I would have to pull up a file from Drive and then add in the fields every single time. It was really time consuming. All the upgraded plans for any competitor tools were around $15/month, and I just couldn't justify that. SignNow's price and functionality has me hooked. "SignNow - the easiest to use and most affordable e-sig platform "
My favorite thing about SignNow is how easy it is to use both over the web and on mobile. The user-interface is so intuitive that you can pick it up and start using it right away without training. I also like the many right-click options on a document because i've at some point needed to use them all. For my needs it does everything I need it to do. The sales team was also very helpful in the decision-making process when I was evaluating this against a competing product at my last company. They took as many calls and demo as we needed to with the Sales Operations team to make sure we had a good fit. I've found that there's no dropoff in functionality from any other e-sig platform i've used and it's much more affordable and even easier to use. I needed a cloud-based way to e-sign documents that was easy to use, accessible from web and mobile, full of features to meet the needs of any document sig request, and affordable. I've used SignNow for everything from tax returns to comp plans to home loan documents, and it's never let me down. "Easy to Use and SO convenient"
I love how easy it is to drag and drop a document into the site and quickly sign, save, and download! When I discovered how to invite other signers, it made me love sign now even more! I use this in my business AND for personal use as well! Nothing! I am certain I am not using all the features of Sign Now... but for my needs, it works great. Easy to use and great pricing! We use it for signing contracts... with our team and with vendors we work with. I love how easy it is to invite a signer to sign the doc! the mobility is great. It's very simple. The title has changed back and for some reason, this is a better name. it feels secure. The font is small and for sure i don't like the awkwardness of filling in text. Not a great experience. It starts small and I have to try and enlarge it, which is hard to do. I would recommend this product- I have used it for over 5 years and it is secure, easy to use and the mobile app works well. I can e-sign everything. I even use it for my kids permission slips, doctor's notes etc. Our support managers will recommend you couple solutions for this. Though, honestly, most probably this is more about browser settings. "SignNow has made the transition of our Executive Director to a remote worker smooth"
The user friendliness of the software. It make it easy to attached forms to be singed and get a quick response and approval. Not an easy way to resend the signer invite when they have misplaced the original email about a document to sign. Our Executive Director needed to work remotely from another state and I started looking at technology we would need to make this a smooth transition. We needed software to allow her to still sign her approval on documents and SignNow has made that possible for a low cost and very user friendly way. Many thanks for your positive feedback and assessment, Terry! We are happy to be part of the paperless office for your top management. SignNow is simple to use and does everything I need. I've used it for both business and personal applications and have been satisfied overall. I've never had an issue with prospects receiving documents and the format has always turned out looking the way I expected. One thing that can be a little annoying is if I add edits to a document, save it, then realize I need to change something I added. Unless I'm missing something, you can't just go back and edit; instead, you have to do do it over. I've had that happen twice on documents with extensive editing and it was super frustrating. In our digital age, it's not acceptable from a business standpoint to require people to physically sign documents. When I first purchased SignNow, my company didn't have an e-sign service, and utilizing SignNow increased my effectiveness dramatically. "Easy to use and less expensive than competitiors"
The interface is very easy to use, it is less expensive than the competition, and I don't use it every day, so it's not a service I am willing to shell out a ton on as far as a monthly fee. SignNow is fair. There are some options that could be easier to customize, such as the outgoing email inviting people to sign your document. To my knowledge, you need to change that email each time you want to send a document, and it would be nice to have a template for that. I mostly use it to send offer letters out to candidates to our company. It saves them time from printing/signing/scanning/emailing the offer back to me. It's easy to download on any phone. Customer's really like it. There needs to be a resend button, cause sometimes I have to send it twice. Althought I think that's the customer email is at fault. Some are not use to Sign Now and dont look in their junk mail. So easy to use. My customer really like it cause you can download on different phones. Great for my customers that are at work and need a change to their policy with having to come into my office. Love it!!! to get customer's signature with out having the customer to come into office. "Sign Now - a great value, simple to use"
Sign Now was very easy to setup and use. The experience for the customers is also very simple, and it's very easy to add fields. We used this for various types of agreements. Custom agreements were very easy to use, but we mostly used it for sending the same templated contract to all our customers. I also enjoyed that it expired the agreement, which helped our closing rate and assisted in tracking our sales team. The only downside is that it doesn't stamp anything on the document to indicate that it was e-signed. Otherwise it's great. There is no better product for the price, hands down. Unless you need overly complicated e-sign documents, I'd go with SignNow every time. We used this to speed up our contract process; it's saved us hours of back and forth. You mentioned "The only downside is that it doesn't stamp anything on the document to indicate that it was e-signed. Otherwise it's great." SignNow offers the stamp under the option download with history of your signed document by clicking the more button. You will see the stamp under the signature .I hope that info helps. We get our documents back faster and there is no confusion with printing and scanning docs or annotating PDFs. Many thanks for your feedback, Oliver! We are glad to know you find SignNow to be a reasonable alternative when it comes to pricing. Sorry to hear about this minor confusion with prices for the Basic plan! Judging from the amounts, it's just your free trial coincided in time with the price change. This app works great. I use it all the time. The best part is that my clients find it simple to use and it is a fantastic way to keep track of all documentation. The only thing that would help me would be to easily be able to change the client name on the the document once it is saved. This product will make your life so much simpler and your work so much easier! I am able to get my documents/agreements signed and returned easily. It works great for me and for the customers. we are glad to know SignNow is making your work simpler and easier! yes, once the document is e-signed - no one can perform any changes in it. Just like it would be with a regular wet-ink contracts and agreements. This feature makes sure both sides have the exact copies of the same document. * We monitor all SignNow reviews to prevent fraudulent reviews and keep review quality high. We do not post reviews by company employees or direct competitors. Validated reviews require the user to submit a screenshot of the product containing their user ID, in order to verify a user is an actual user of the product. Hi there! Are you looking to implement a solution like SignNow?